While the printed book seems to always be in peril in today's digital world, the printed Holiday Sales Catalog, if judged by the daily mail delivery seems to be expanding exponentially. While the world is certainly at your fingertips via the Internet, I still secretly enjoy browsing my favorite catalogs as they arrive. Mostly I enjoy the book and reading related catalogs (and King's Ranch, Gorsuch, Orvis, Woolrich, Cabelas), I always quickly flip through Levengers Tools for Serious Readers. Today the Levenger's Holiday Sale Catalog arrived and after a 30 second browse, I found a new product that will be on my mind. A holiday gift for a niece or nephew, a friend, myself, our house? 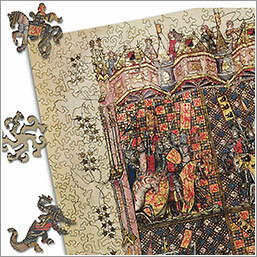 Who wouldn't enjoy a 450 piece jig saw puzzle based on a Medieval Illuminated Manuscript in the collection of the Bodleian Library, depicting the life of Alexander the Great, ages 8 and up. The age restriction seems to tip the balance in my favor as the niece and nephews are all under 5 at this point. I need to think this through. Maybe, just like hundreds of books, it will simply be filed in the "want list" in my mind for future reference, a spare $149, or a great sale!